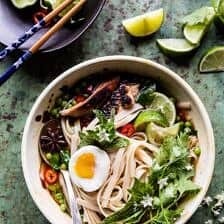 This Spicy Italian Pesto Noodle Soup is my go-to dinner on nights when I am craving Italian, but also want something warming. Spicy Italian chicken sausage simmered in a basil pesto broth with carrots, kale, a little lemon, and plenty of noodles. Finish each bowl off with a sprinkle of cheese and serve with crusty bread. It’s hearty, full of colorful veggies, and so delicious. Great for just about any night of the week. And the leftovers the next day, they make for the best lunch! I’ve been so exited for Halloween this year. Something about Halloween is just the best. It’s such a fun day of the year. I mean it’s pretty much expected that we go for all the candy, cookies, and pizza we like…no excuses necessary. Or at least that’s how I see it. Except over here we’ll be swapping the pizza for soup. Because it’s cold and snowing here, and I just need a bowl of (cheesy) soup in my life. Not going to sugar coat it, my week has been hard. Monday just started off on the wrong foot. I don’t know If I woke up on the wrong side of the bed or what, but man oh man, it was not an easy day. You know those days when one thing goes wrong and then every other thing decides to go wrong with it? Well, that was my Monday. Just looking back on it makes me cringe. All I have to say is that technology is the best…and technology is also the absolute worst. When technology fails you, it’s not fun. And that was a big part of why my Monday was so rough. But it’s all ok. First world problems. Nothing major. Just a bad day. It happens. 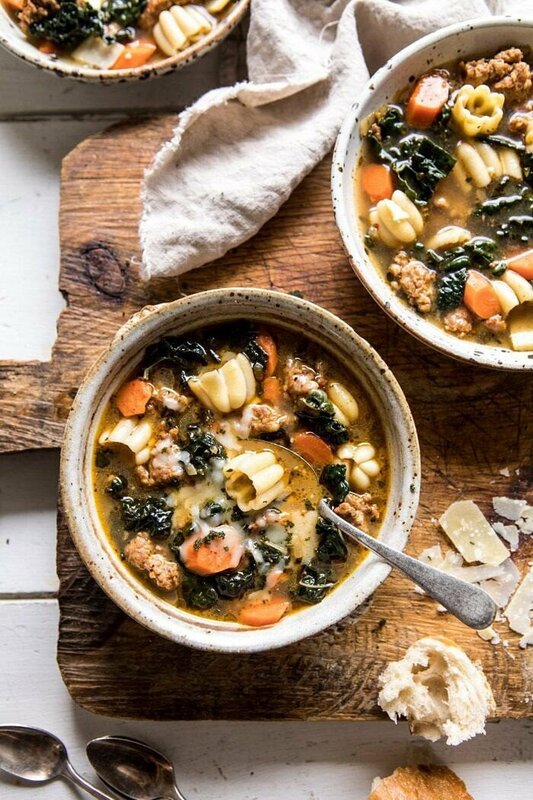 Like this soup, which is very, very good. Not sure if this recipe is really Halloween appropriate, but it’s pretty delicious any night you decide to make it. And I don’t know, coming home to a bowl of this tonight after trick-or-treating sounds pretty great to me. Thinking you should try it. Here’s the deal. I’ve been on a real soup kick this fall. In the last two weeks alone I’ve made a coconut sweet potato lentil soup, a butternut squash soup, and a French inspired shallot soup. Today it’s Italian Noodle Soup, and next week? Something pumpkiny, and perfect for Thanksgiving. Sure, hope you guys like soup! Right now though, let me tell you about this Italian Noodle Soup. It’s a little spicy (but not overly so), full of vegetables (the good ones), has spicy chicken sausage, lots of noodles (mine are pumpkin shaped and I am so obsessed with them), and topped off with cheese (provolone to be exact). 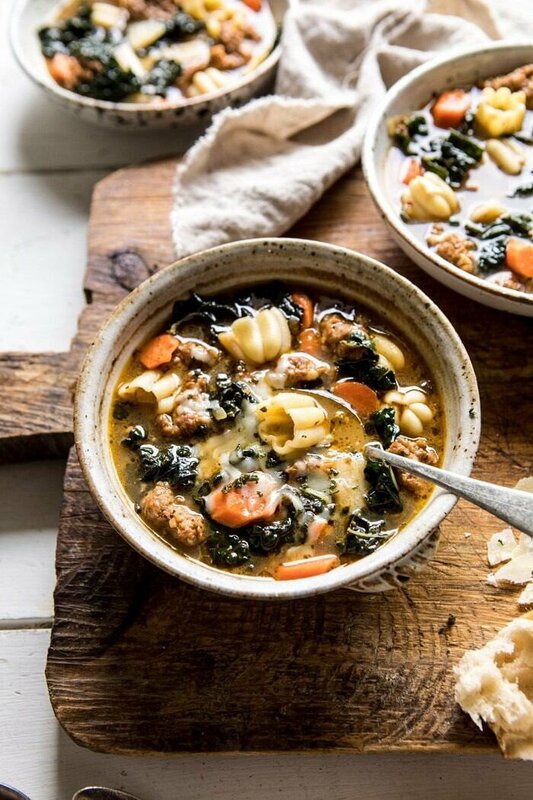 It’s simple, it’s pretty quick, and it’s one of the better bowls of Italian soup that I’ve ever had. The secret? A parmesan rind, basil pesto, lemon, and cheese. Ok, and pasta – lots of pasta. The parmesan rind and basil pesto add a salty, herby flavor to the broth. The lemon adds a nice zing of freshness. And the cheese and pasta? Well, those don’t need much explaining, they’re always good. Whether you end up making this tonight, sometime this week, or even in the next couple of weeks, it’s sure to become a favorite. 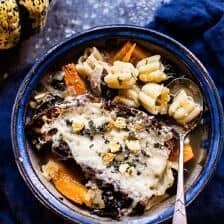 I’m loving serving this up on bitter cold nights like tonight, with a good loaf of crusty bread. 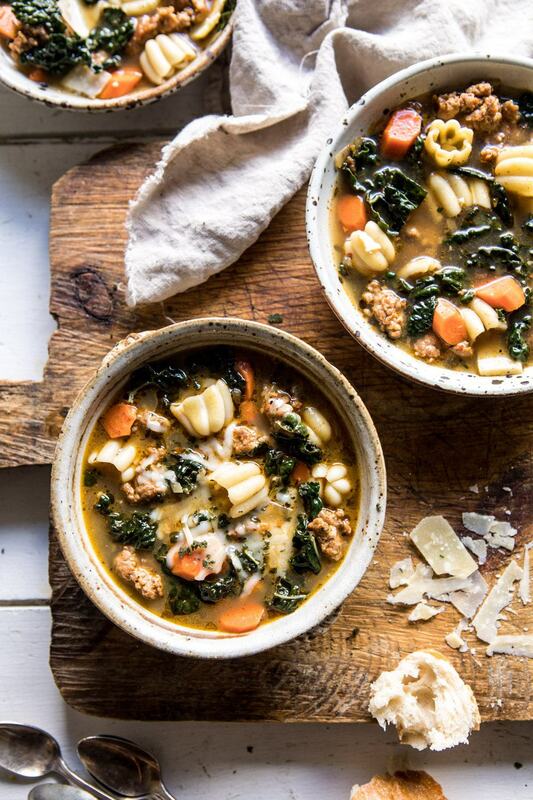 Normally I’m either making chili or pizza on Halloween, but this soup is the perfect switch up! PS. I feel bad for all the trick-or-treaters out in my town tonight. It’s SO cold and snowy…hoping it’s a little warmer for the rest of you! Have fun tonight! If you make this soup please be sure to leave a comment and/or give this recipe a rating! Above all, I love to hear from you guys and always do my best to respond to each and every comment. And of course, if you do make this recipe, don’t forget to also tag me on Instagram! Looking through the photos of recipes you all have made is my favorite! Spicy Italian chicken sausage simmered in a basil pesto broth with carrots, kale, a little lemon, and plenty of noodles. Finish each bowl off with a sprinkle of cheese and serve with crusty bread. It's hearty, full of colorful veggies, and so delicious! 1. Heat the olive oil in a large pot over high heat. When the oil shimmers, add the chicken sausage and shallots, and brown all over, about 5 to 8 minutes. Reduce the heat to low, add the carrots, sage, thyme, and a pinch each of salt and pepper. Cook another 5 minutes. Add the broth, pesto, parmesan rind, and lemon juice. Simmer over medium heat for 15-20 minutes. 2. Meanwhile, bring a large pot of salted water to a boil over high heat and boil the pasta until al dente according to package directions. 3. Stir the kale into the soup, cooking another five minutes. Remove the parmesan rind. Taste and season with salt and pepper. 4. Divide the noodles among bowls and pour the soup overtop. Top each bowl off with cheese and allow the cheese to melt slightly. Enjoy! This looks absolutely stunning. 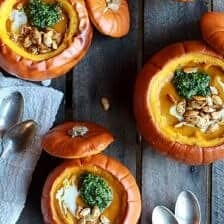 This recipe is completely Halloween appropriate! It’s exactly what I want after walking around my neighborhood checking out everyone’s pumpkins and decorations! Absolutely cozy perfection. Have a great Halloween and enjoy the snow. YES! I am so glad you like this and I hope you try it Debs! Thank you and I hope you had a Happy Halloween! Wishing you a much better rest of the week always; and a very happy Halloween! Thank you so much Liz! I hope you had a great Halloween as well! sounds very good to me!! I love kale. Thank you! I hope you try this one Ruth! Uh, could you imagine this dish in a vegetarian version? Would love it!! It’s definitely going to be a chilly night here in Dublin (Ireland) for the trick or treaters bless them – all costumes will hopefully be layered underneath to provide a bit more heat! Having a bowl of this soup beforehand would also help I would imagine!! 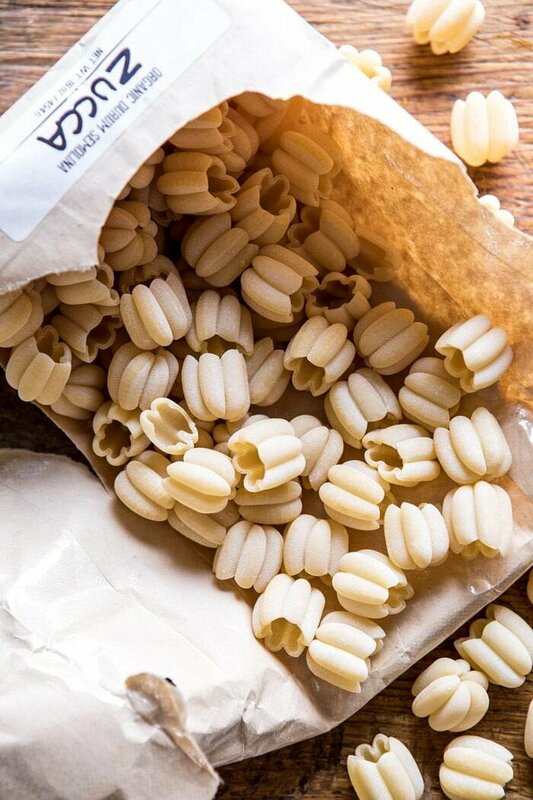 Love the shape of the pasta shells, I want to try these for sure! Thank you so much Rebecca! I am so glad you’re loving this recipe and I hope you try it! Hi! I’m just wondering what Photoshop you use. Also, was it easy to learn? I am a new blogger and not great with technology! Hi Ally! I use Lightroom for my photos, but I make sure to take them in natural lighting. Once you start using it more it will be a breeze! I hope this helps, but please let me know if you have any other questions! YES! I am so glad you like this! Thank you China! 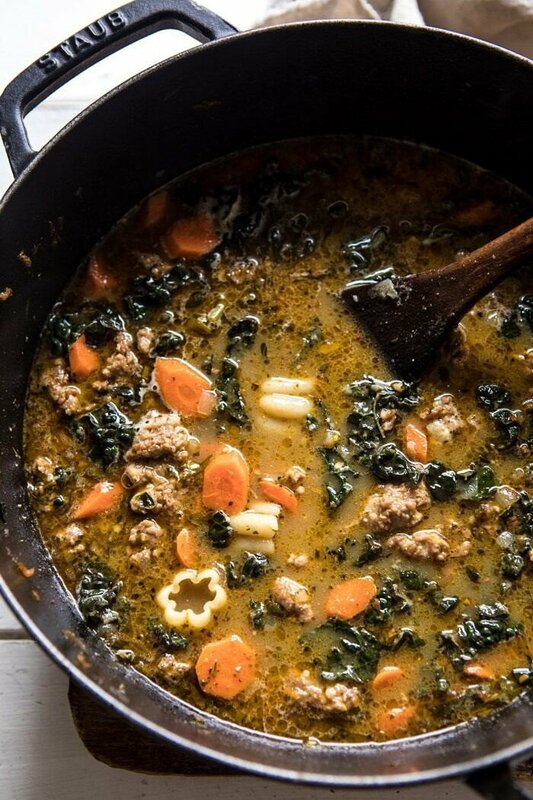 Where did you find those adorable noodles shaped like pumpkins? They make the soup look SO unique (and fun)! Hi Marcia! They sell them at Trader Joes! I hope you love this! In the Cincinnati area it’s pizza or chili on Halloween but this soup looks too tempting to pass up. YES! I hope you try this and enjoy it Nancy! Thank you! Missing the Parmesan rind from ingredients. Could one sub spinach for the kale? Loving today’s recipe posts – going to enjoy all of them. Thanks, as always. I really liked this post, keep up the good work. This looks amazing!! I love soups, and this is so creative!! I know those days where everything seems to go wrong, and you feel like you’re in a cartoon or something. But food always makes things better. At least for me. But! One thing! Could you possibly provide metric (UK) measurements for your recipes? Converting is hard for me, because I’m not good with numbers, and I’d like to be as close as possible. Hi Rae! Totally agree, food always makes it better haha! 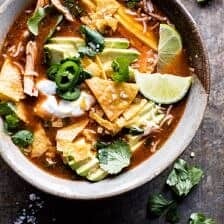 I am so glad you like this soup and I hope you try it! I will look into adding the metric measurements as well! Looks so good. Pinned to try soon. Thanks! I hope you love this! Thank you Rie! Sounds delicious!! What if I swapped out sausage for regular chicken? Should I add more spice? Also, what’s your favorite pesto? I really really want to make this. I love pesto and pasta and soup and the flavor sound just perfect. I’m not a big lover of italian sausage, but that can be easily substituted. I absolutely can’t wait to give this recipe a try! I hope you love this recipe, Danielle! Thank you! Where did you find spicy Italian ground chicken sausage? Absolutely Wonderful!!! Will make again! Sounds delicious. Will definitely try it soon! How Necessary is the sage? Does that flavor stand out? This soup is amazing! Not too many ingredients and simple to make but the flavor is perfect! I’ve already sent this to my mom and girlfriends! Thank you so much Britt! I am so glad this turned out well for you and thank you for sharing it! I hope your mom and friends love this as well! 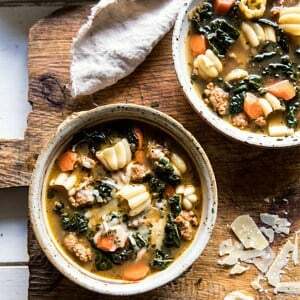 I literally just finished making and eating this soup and it’s going on my favorite recipes list, It was so easy to make yet so flavorful, the hints of sage, thyme, lemon juice, parmesan, every spoonful was like the first one! Thank you for yet another amazing recipe! I am so glad you loved this Nicole! Thank you! This is one of the most delicious soups I’ve ever made! Warms you up but isn’t heavy. Moving this to the Tried and True box! I am so glad this turned out perfectly for you! Thank you so much Laura! Made this tonight and it was greatly enjoyed by the fam! It’s quick, easy, healthy and lots of flavor. I used turkey sausage and broth. Just delish! It will go into rotation for us. ⭐⭐⭐⭐⭐Thank you for a great winter soup! Will post a photo on IG @pixiegoes2market. I cant wait to check it out! Thank you so much! I just made this, sitting down to enjoy a bowl. I forgot the pesto and added cannelloni beans. My kids are loving it!! I am so glad they are liking this and I hope you loved it as well! Thank you Jamie! Just had this for dinner tonight and it was delicious! Perfect for a cool Canadian fall 🙂 Will definitely be adding this to my arsenal! I am so glad you like this! Thank you Elaine! This soup is really delicious! It definitely hit the spot on these chilly Indiana days. So far, I’ve loved ever recipe I’ve made of yours. Thank you!! Thank you so much Ceceil! I am so glad you loved this soup! Made last night, by recommendation of my sister and will definitely be making again! Couldn’t find ground chicken Italian sausage, so I used sliced pre-cooked links of Italian sausage. A couple things I think I’ll change next time: use ground pork Italian sausage (the chicken one I used seemed almost too lean), add a little more broth, add some red pepper flakes for more spice! Overall, it was a hit and is a great way to use my frozen pesto from the garden over the winter! I am so glad you both loved this Emmaline! Thank you so much! Do you think it would work with ground beef? I don’t have any spicy chicken sausage! This soup looks delicious! I have some chorizo sausage in the freezer; do you think this could work in place of the Italian sausage? Dear Tieghan, this tasted gorgeous!! I took one sip of the broth and my eyes widened!! Will be making again and again. Thank you so much for sharing your talent with us all. So many warm wishes for the holidays to you and yours. Thank you so much Georgina! I am so glad you loved this soup! Wow! 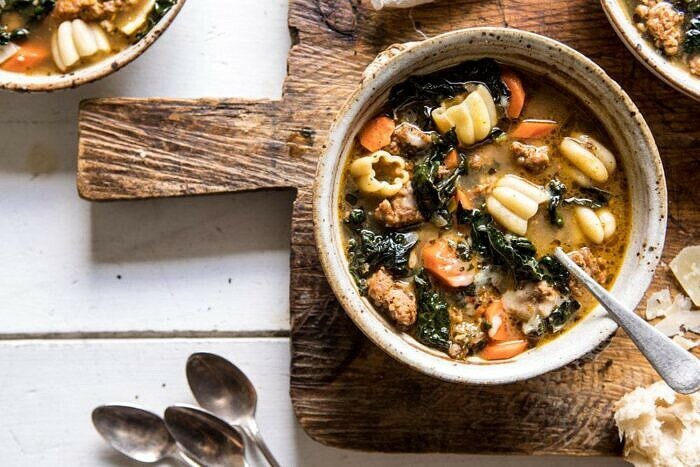 This soup is pure perfection. It was easy to make with accessible ingredients. The taste was over the top delicious. Would love YOUR ideas on a simple bread to go with. We just used a take and bake and toasted with butter and Parmesan. I’m sure you have some ideas up your sleeve!!! Wow thank you so much Della! I am so glad this recipe turned out amazing for you! I am so glad it still turned out amazing! Thank you Swede! Hi Dear, are you really visiting this web page daily, if sso then you will absolutely obtain good experience.